Have you been affected by drought? Alberta’s main cattle group is warning the provincial government to stand ready as a severe feed shortage could soon lead to a major culling of herds. Many ranchers depleted their hay stocks after a cold spring delayed pasture growth, and have seen only meagre production this summer in the face of dry, hot conditions, said Charlie Christie, chair of Alberta Beef Producers. That prompted Christie to contact Alberta Agriculture and Forestry to warn officials that assistance programs may be needed soon. “We just felt it was time to make sure the awareness was there so if, in fact, we need to ask for some sort of assistance, perhaps the ball will get rolling a little quicker,” he said. One program that can help those who have to sell off cattle because they don’t have enough feed is the Livestock Tax Deferral Provision. That federal program allows farmers who sell part of their breeding herd due to drought or flooding to defer a portion of sale proceeds to the following year. Last year, drought prompted Ottawa to designate the southern half of the province — nearly 30 counties and municipal districts — as “prescribed” regions eligible for the program. But the situation may be considerably worse this year. 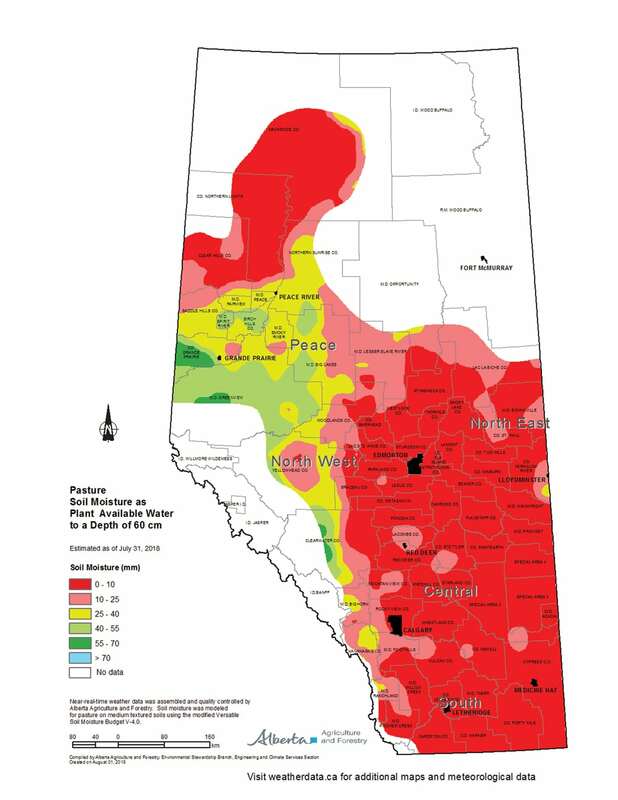 As of the end of July, almost all of the pasture land in the province in the south, east and central regions along with the northern Peace are bone dry. Deferring income from a herd reduction dictated by drought is only common sense, said Christie. Deferring the income from sales not only reduces the tax bill in the current year but also in the following one for producers who restock their herds. There are other tools that government can employ to help producers struggling to feed their herds. Those include allowing grazing on public lands, haying along roadsides, feed freight assistance, and “drought disaster” loans. The call to the government was also intended to encourage producers to reach out if they’re running out of feed, he added. That’s especially important for younger producers, he said. But young or old, producers being squeezed by drought shouldn’t be afraid to seek help, said Christie. Glenn Cheater is a veteran journalist who has covered agriculture for more than two decades. His mission is to showcase the ideas, passions, and stories of Alberta farmers and ranchers.